Precious metals clad on strips of copper and iron based alloys. Multi-layer and multi-strip tapes of variable widths and thicknesses are produced using Tanaka's own unique continuous bonding process. These materials demonstrate the highest level of performance while utilizing a minimum amount of precious metals. 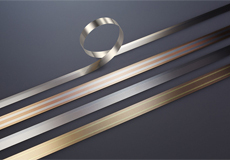 Beryllium copper based tapes and solder clad materials are also available. Available in a wide range of thicknesses, from 0.5 µm to 50% of total thickness. High bonding strength allows a high degree of bending. We supply a long length tapes with a high precision finish. For shapes,"1" indicates an inlay type and "0" indicates an overlay type. Contact us regarding materials, shapes and dimensions. sensors, switches, relays, connectors, etc. Tanaka provides clad products with a base material tailored to the application including C1020, C5210, C7701, CuNiSn alloys, BeCu, Kovar, and Corson alloys. Please inquire regarding combinations with bonding materials. Case Study:New product development project aimed to win out amidst fierce price competition.